oin us for an exceptional evening of food & wine as The Blue Point welcomes our friend, Chef Joe Sparatta. 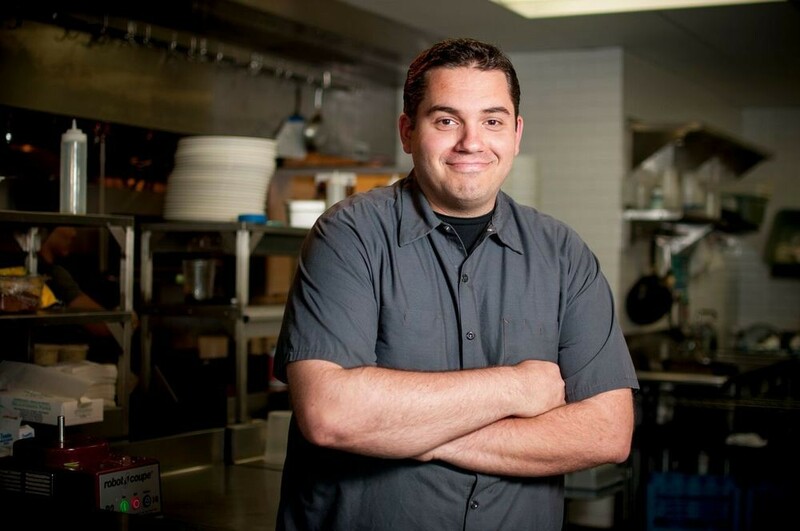 A native of the garden state of New Jersey, Joe was born into a family of chefs, and took up the craft at an early age. It was not until he began working at The Ryland Inn under Chef Craig Shelton that he truly found his passion. At the time, The Ryland was the only New Jersey restaurant to be awarded four stars by the New York Times, and the only to be awarded Relais Gourmands by Relais & Chateaux. Joe received additional training with Chefs David Bouley, Eric Ripert, and Michael Laiskonis in New York City before joining Chef Scott Anderson to open elements in Princeton, NJ. While Sous Chef and Pastry Chef at elements, Joe managed a team that received top ratings from local and New York press, garnered publication in Art Culinaire, and earned a spot in the top 20 “most important restaurants” in America by the Opinionated About Dining Guide. Since moving to Virginia and opening Heritage, the restaurant has garnered numerous accolades including: Chef & Restaurant of the Year Elby’s 2015, Star Chef.com Rising Star Winner 2014 Washington DC area, Southern Living’s 100 Best Restaurants in the South 2014, and Richmond Magazine’s Best New Restaurant 2013. Joe was awarded the Elby award for Chef of the Year again in 2018. In his latest project, Sparatta has teamed up with fellow 2014 D.C. Rising Star and “Chef of the Year” Elby winner Lee Gregory of The Roosevelt, and local Richmond farmer Matt Gottwald to open Southbound. This seasonally driven, upscale casual eatery Bon Appetit has recognized Southbound as one of “America’s Best New Restaurants 2015”. Most recently Southbound won the 2016 “Best New Restaurant” Elby award. Chef Sparatta, in collaboration with our Blue Point chefs, will dazzle you with a five course tour de force tasting menu that will comprise the best of our regions farm to table philosophy. Wines will be paired by our Advanced Sommelier from the Court of Master Sommeliers, Simon Kaufmann. Reception with champagne and hors d’oeuvres begins at 6:30pm followed by dinner. Believe us…it will be worth it! Attire for the evening is nice casual. We look forward to hosting you!